Congratulations to "Cher'ley", the winner of Kate's giveaway. Thank you to all who participated! Kasey Edwards, the heroine of Forewarning, is a physical therapist who employs alternative techniques when working on her patients. She’s learned how to manipulate energy to affect bodily systems and uses her skills to save the life of an injured man. 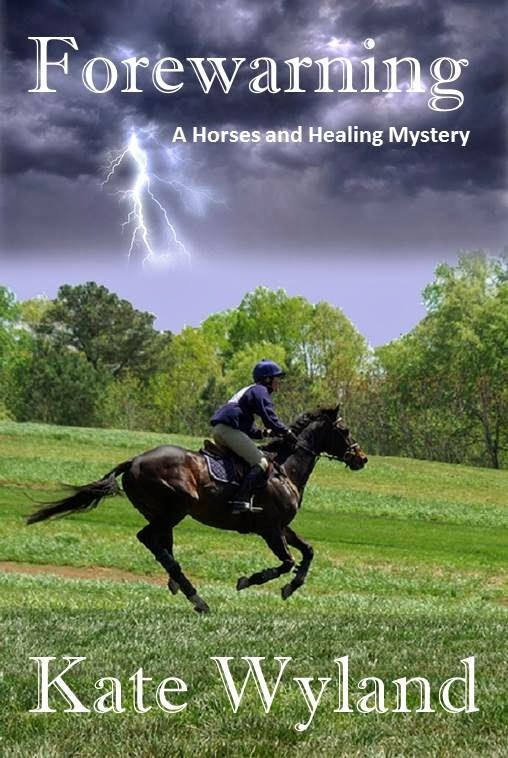 The story is first and foremost a romantic mystery and is set on a horse ranch. However, when I started submitting to writing contests and to agents, I was advised to classify it as a paranormal story. I had a hard time with that concept because to me, paranormal meant vampires, shapeshifters and such. An energy worker hardly fit in that category. My other problem with that advice was that Kasey is based on real people who actually do the kind of work that she does, not fantasy figures. While most people aren’t yet familiar with these particular techniques, the knowledge and use of alternative modalities is growing exponentially. Complementary (a more accurate term) medicine is becoming accepted by more and more people. There are even Integrative Medicine departments at major medical schools and clinics, where physicians learn to integrate these techniques with their traditional practices. So while Kasey skills are a little woo-woo, they definitely are not fantasy. Initially, I wanted to be as accurate as I could, but I found, like many authors before me, that real life doesn’t always make for a good story. So in a couple of instances I took some literary license, but mostly I remained true to reality. The excerpt below describes something I have seen many times. TJ watched while Kasey placed one hand on the mare’s spine and another low on her left hip. She kept them there for almost ten minutes while talking softly to the horse and Ben. As far as TJ could see, she was doing nothing more than lightly touching the horse. TJ stared in amazement as a very different horse walked out of the barn. Instead of limping, Doll walked along and gazed at her surroundings with interest. I will be giving away an ebook copy of Forewarning to one person who comments and leaves an email address. Kate Wyland is a life-long horse nut who started riding at three years old and can’t imagine life without them. She’s taken part in a great variety of equestrian activities but her greatest loves are dressage and trail riding in the mountains. A few years ago, she exchanged her tech writing hat for a fiction writing Stetson. Suspense, romance, horses and sometimes the paranormal are the themes she likes to explore in her books. And she delights in sharing her love of animals and country living. Hope you enjoy it! Thanks for stopping by. I understand why the push to paranormal, though I firmly believe in the reality of this type healing. No matter, this sounds really wonderful. I understood the push too. In fact, in the first contest I entered Forewarning placed third in Paranormal. Greetings, Kate! Loved the excerpt and look forward to reading FOREWARNING. You are a new author to me and I am so excited to meet you! I believe in the power of touch/massage not only for healing, but for showing compassion and sharing positivity. Having grown up with horses, I also know how sweet and intelligent they are -- and would trust their instinct and "intuition" any day. :) -- I have a friend who is a chiropractor who uses alternative methods in her "human" practice but also specializes in canine and equine therapy. Does she ever have stories to tell!! Thank you so much for the giveaway. FOREWARNING sounds awesome! Thanks so much for the kind words. I love meeting new readers too! I've used chiros and a variety of other alternative workers for my horses. They all have fun tales to tell. Isn't it great? I enjoy a premise that involves horses! The subject sounds very interesting! I hope people can open their minds and learn a little from it. This is a great book, Kate. Can't wait to read the next one. I've been spending so much time promoting and playing with social media, that I've had a hard time writing. That's why I'm taking two weeks off and hide in my writing cave. How very cool, Kate. I didn't know this was the story within your novel. This is very intriguing. I'd love to read it. Given your connection with Max, I suspect you would enjoy it. Such a beautiful excerpt thank you. You could feel it. Love the term "woo-woo". Haven't heard that in years. Horses have been part of my life since I was a baby, so of course I have to write about them. And I love mystery/suspense. Reiki and foot zone are my first choices for medicine. Matter changed by energy. Works every time. Kudos to you for working that into a book! I'm not familiar with the term "foot zone." I suspect that is what I've heard called reflexology. I'm so glad all these different ways of healing are becoming more accepted. BTW: You forgot your email address, if you want to be in the drawing. I don't see how this is so very different from Reiki, so agree with you that calling it paranormal would be a stretch. Your excerpt brought me back to the days when our newspaper was delivered every afternoon by a young woman on horseback. She would deliver to us last, let her horse graze in our enormous front yard, and have tea with my mother. I've been a horse nut ever since, although I don't get a chance to ride these days. How fun to have had your newspaper delivered by horseback! And how nice that the gal had time to have tea with your mother. Rather different from today. Thanks for the delightful image. Thanks for taking a look Cherley. This type of work does wonders for backs and every other part of the body.